Lake Titicaca, in Bolivia, is the highest altitude body of water in the world at 3800 meters above sea level. It was formed thousands of years ago as glaciers melted. 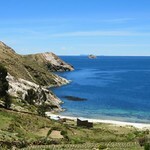 Isla del Sol, or Island of the Sun, is a large island that contains many Incan ruins dated back to the 15th century.